McClain senior Devin Carter attacks the paint on a layup attempt Friday, Nov. 30, at Hillsboro High School where the Tigers battled the East Clinton Astros in the Ohio Valley Hoops Classic. 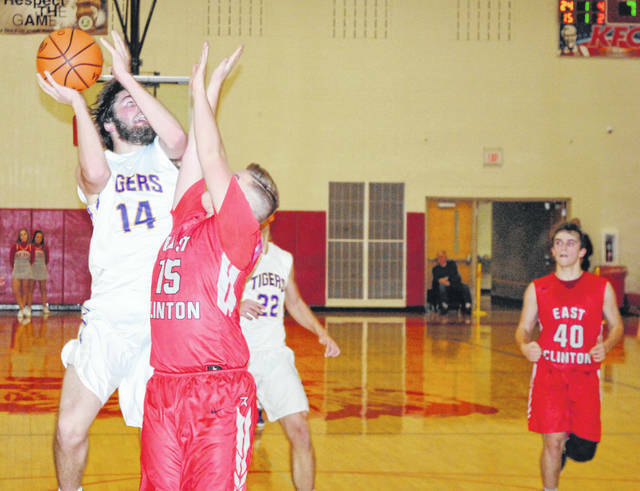 The McClain Tigers got their season started on the right foot Friday, November 30, at Hillsboro High School when they took on the East Clinton Astros in the Ohio Valley Hoops Classic and picked up the 50-38 win. The game was a defensive showcase for both teams that saw the Tigers earn a 9-7 lead after one quarter of play and a 22-19 lead at half time. In the third quarter the Astros really locked down on the Tigers and limited them to just four points from senior Devin Carter while scoring eight of their own to take a 27-26 lead into the fourth and final quarter of play. McClain’s Kobe Penwell found a rhythm in the fourth quarter and he recorded all nine of his points in the frame to lead the Tigers to a 24 point outburst while they held the Astros to 11 points to swing a one point deficit into a 12 point victory. https://www.timesgazette.com/wp-content/uploads/sites/33/2018/12/web1_McClain-vs-East-Clinton-14-Devin-Carter.jpgMcClain senior Devin Carter attacks the paint on a layup attempt Friday, Nov. 30, at Hillsboro High School where the Tigers battled the East Clinton Astros in the Ohio Valley Hoops Classic.